I got introduced to Kate DiCamillo’s books when I heard of Flora & Ulysses. That hooked me. I read and reviewed it, and could not stop talking about it to everyone I met. Well, almost everyone. Kate DiCamillo’s books have a charm to them. They leave you with a gooey feeling in the pit of your stomach. They somehow manage to heal you at various levels and this is what I call “magical” books. Books that do something to you, that perhaps change the way you feel and make you a better person. Yes, books do that as well. “The Tiger Rising” was first published in 2001, her second novel, after Because of Winn-Dixie. I read it in 2014. The first book of the month and the month could not have started in any other way. There are books which I always believe come to you when you want them to. They cannot happen to you before a designated time. “The Tiger Rising” is a heartfelt tale of a ten-year-old boy Rob, a girl Sistine and a tiger. Rob and his father have relocated after his mother’s death. They now stay at a motel. Sistine and her mother are starting anew, after Sistine’s father left them. Sistine waits for her father to return. Rob finds it hard to speak about himself. His secrets are locked. His is bullied at school. He doesn’t want to go to school. And then suddenly, he discovers a tiger and life changes. The book is heart-breaking. It is sad. It is happy. It is bitter. It is hopeful. It will make your heart sing and also wrench it at times. I had no idea where time flew by as I immersed myself in this novella. “The Tiger Rising” needs no validation. It needs nothing, but more readers to read it and be amazed by the power of words. 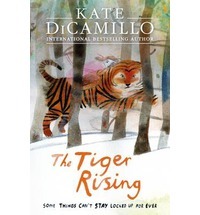 This entry was posted in Books, children's fiction, Kate DiCamillo, Review, Walker Books and tagged animals, Children Books, Kate DiCamillo, The Tiger is Rising, Walker Books on August 2, 2014 by thehungryreader.